Four years ago keeper Barry Roche was convinced his Morecambe career was at an end. Roche has not featured for Morecambe since the Shrimps’ draw against Newport County at Rodney Parade in October. But now he has returned to full fitness again following a wrist operation and keen to claim the number one shirt he has made his own for so long. But four years ago his injury concerns were much more concerning. “I was told that I had a 50-50 chance of resuming my career following hip surgery,” said the 36-year-old. “I had to face the fact that I wouldn’t play again. It was very scary, and with a young family to look after, I was absolutely devastated because football was my life. “The surgeon warned me that the recovery would be long and hard, but then the Professional Footballers’ Association offered to fund my recovery at St George’s Park, where the England national team train. “Morecambe didn’t have those facilities, and I was treated by some of the finest physiotherapists in the land. “It was an incredible gesture by my union, absolutely fantastic, and that special rehabilitation saved my career. “The PFA has played a huge role, helping me prepare for life after football and when Morecambe suffered a financial crisis they stepped in. “The hardest thing when you are playing for a lower league club is the uncertainty and lack of security. “You are playing for your future every season and we had 22 players who had not received a penny for several weeks, many couldn’t pay their mortgage or bills. “One of the lads had bought a new house and told me that he had £26 in his bank account and that he couldn’t afford to travel to training. “It was a desperately worrying situation, but every day I spoke to Simon Barker, the PFA assistant chief executive, who gave us all superb advice and the help we needed. “Simon travelled from Manchester to address the players and the PFA paid our wages. “It produced a siege mentality, bringing us together, with the players, supporters and staff determined to keep us afloat. 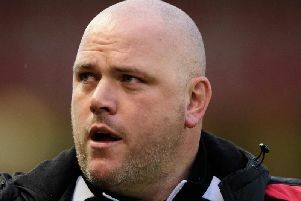 “And when the manager, Jim Bentley, was fined £1,000 following a touchline incident the supporters raised the cash to pay it. 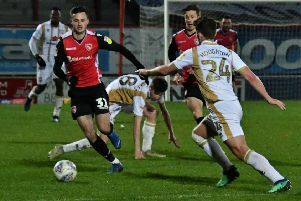 Roche is hoping he will see action again at the Globe Arena before the end of season as his Morecambe contract expires in the summer. He could yet stay on with the Shrimps – but Roche already has one eye on the future. “Missing so many games this season gave me an insight into what it would be like when I finish,” he said. “But I’m back now, and I’m in great shape for the next chapter of my career. “I want to stay in the game when I hang my boots up. I’m not interested in becoming a manager – I want to coach and try and pass my knowledge on to the next generation. “The PFA has provided me with that first foundation stone, funding my UEFA B goalkeeping and outfield badge. “I now coach the goalkeepers at Morecambe’s Academy, aged nine to 16. “It is very fulfilling when you see a young goalkeeper using your advice to better himself and I do take immense pride in that. “I’ve always been fascinated by the media, how they report football and sport. “So, after some brilliant advice from the PFA, I took the plunge and enrolled to study for a degree in sports journalism, my course funded by the union. “It was tough, making a 200-mile round trip from Morecambe to Stoke-on-Trent twice weekly after training to study in a classroom. “I had not done any serious education for 10 years, so it was an intense experience and a very challenging one. The first lecture was a three-hour talk on law, and I thought, ‘Wow – this is going to be hard’. “It was, but the course developed by former Sheffield Wednesday defender Lawrie Madden, is designed to give players the best possible chance of succeeding in the industry. “It was a strange feeling to be on the other side of the microphone, but it taught me so much and was very enjoyable. “The PFA had backed me, so I was determined to finish the course and I emerged with a BA Honours in Professional Sports Writing and Journalism. Morecambe goalkeeper Barry Roche believes that Peter Schmeichel was the greatest goalkeeper of all time. Roche said: “In my book, Manchester United’s Peter Schmeichel was the best ever. “I’m a big lad, six feet five inches, and I’ve got a presence in the penalty box, but Schmeichel was a man mountain. I tried to copy his style, a lot of things he did to make a save – positioning, craft and incredible reactions. did. I’m not that type of person.